Bombay Beach, Salton Sea • Joe Forkan 2010 Oil on Panel 10" x 10"
Last week I made a trip out to the Salton Sea with painters Andrew Dickson, Eric Merrell, Yu Ji, and Larry Groff for 4 days of painting. I had never been there before, and didn’t really know much about it. The over-salinated inland sea is situated a couple of hundred feet below sea level, directly over the the San Andreas Fault, and a bit south of Joshua Tree National Park. We stayed in the tiny town of North Shore, and painted along the edge of the sea, and in the canyons in nearby Mecca Hills. It was a challenging environment to paint. Bombay Beach is a desolate little spot out of some post-apocalyptic vision. The beach is littered with dead fish, (victims of the increasingly salty water), that are largely left uneaten by the migrating birds. The lumpy, salt encrusted remains of building foundations jut out of the ground, punctuated occasionally by decimated trailers and piles of debris that were once trailers or shacks, now long abandoned. 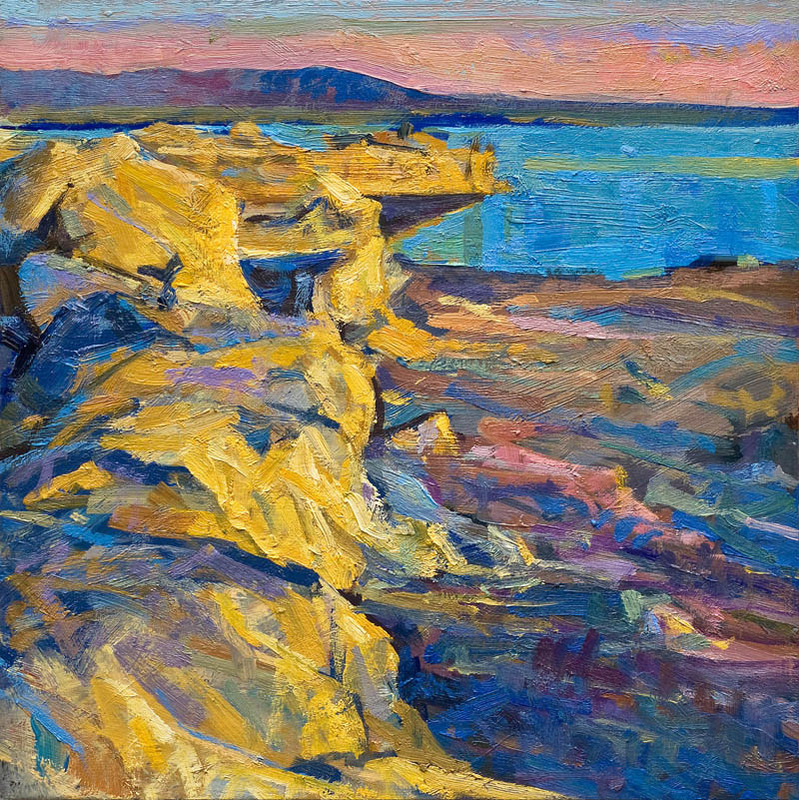 In midday, harsh sunlight washes all the color out of the environment save for the extremes of gray-yellow highlights and deep, dead purple shadows. 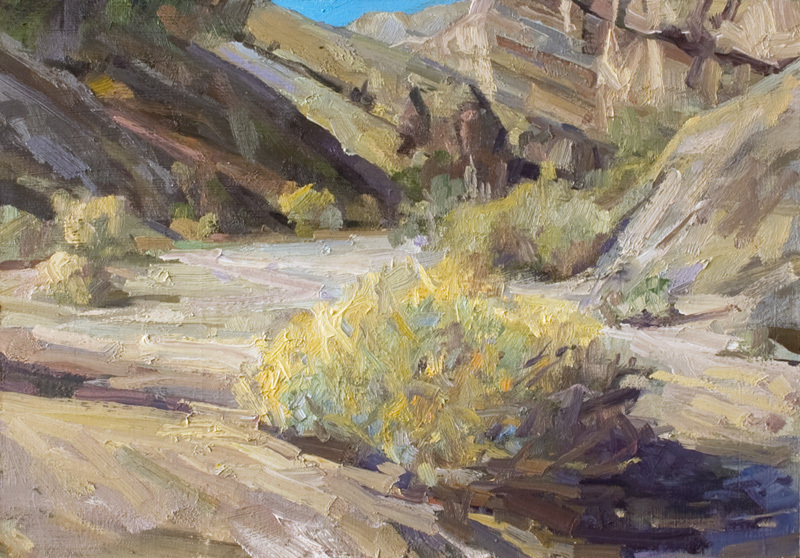 Box Canyon, Mecca Hills • Joe Forkan 2010 Oil on Canvas 12" x 12"
Towards sunset the desert really lights up. Long cast shadows of rich blue and purple cut across sand lit orange underneath skies washed with pinks and pale greens. 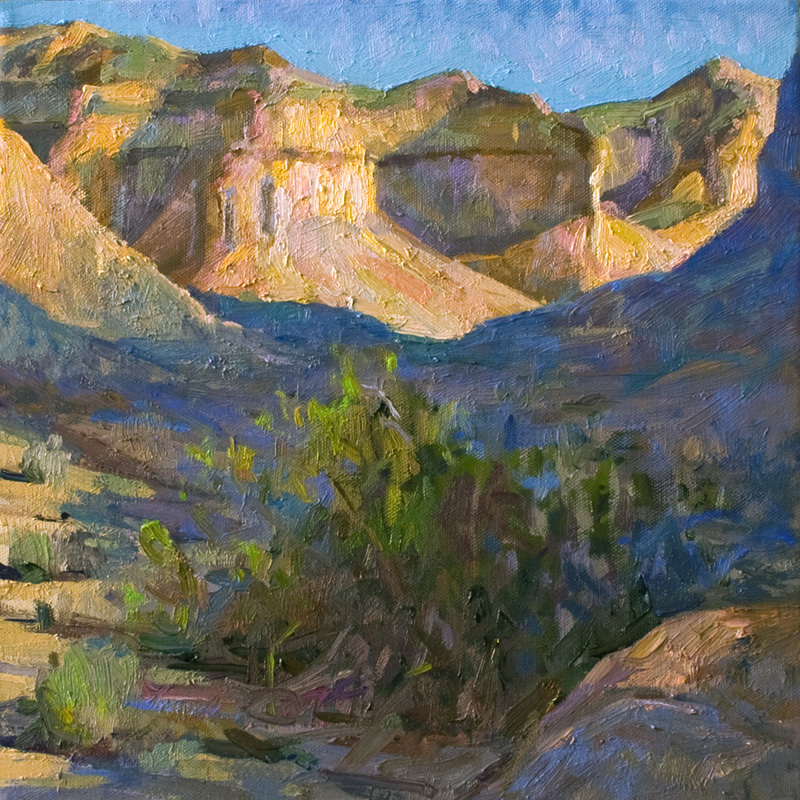 In Box Canyon, where we painted a few mornings, you could see the color quickly drain out of the environment as the sun climbed the hills. I am used to similar dynamics of color from my years in Tucson, but the extremes and speed of the changes in the gray hills were remarkable. In Ireland this summer, I slowly weeded out the stronger colors (Cadmiums, Phthalos, and Dioxazine Purple) from my palette, and the color relationships in the paintings seemed to make more sense in that environment of rich dark greens, dark blues and gray red-violets, but it was clear very quickly that the harsh, extreme light of the Salton Sea demanded a much more chromatic palette and a more aggressive approach. The weekend was also great for conversations about art and painting, (and the best Mexican food I’ve ever had in California – Plaza Garibaldi Restaurant, in Mecca). Dry River Bed, Box Canyon, Mecca Hills • Joe Forkan 2010 Oil on Panel 14" x 10"
This entry was posted in California, Landscape Painting, Painting Trips and tagged Andrew Dickson, Bombay Beach, Box Canyon, Eric Merrell, Joshua Tree National Park, Larry Groff, Mecca Hills, North Shore, perceptual painting, The Salton Sea, Yu Ji on November 18, 2010 by Joe Forkan. Stunning as always! Thanks for sharing. I’ve always wanted to photograph there for a weekend! Joe, those are some really great paintings! Looks like you really captured the colors and atmosphere of the desert. Wow. You have gone from amazing to unbelievable as a painter. Those shadows and colors are alive in a way most can only dream about laying down on a canvas. Astonishing stuff…sorry for all the hyperbole, but damn. Thanks a lot, Max. I hope you’re well. Let’s catch up soon! The Salton Sea never had it so good. Work looks great. Hey Joe, that was a fun trip painting with everyone. I agree about Plaza Garibaldi! Really nice pieces, I like the Bombay Beach one, and the canyons are fantastic too. Yeah, those are really amazing, Joe. Shadows are unbelievable…or I guess I should say BELIEVABLE. As one who has spent a considerable amount of time in the desert, these have that right “feel”. My favorite is the third one, Dry River Bed. I always enjoy your painting… It makes me happy when you send me your new painting… I think I am as excited as you are when I see your your new paintings… I think you are a great artist… I wish I could be like you some day… You always inspire me. I love your work. amazing work Joe like always,,, I wanna start painting traditional again a least the figure. Bombay Beach is my new favorite. Glow it!